Below is a news article from the Associated Press that details Allstate Insurance Company’s finally agreeing to pay a $7 Milliion fine for failing to disclose key documents regarding the manner in which it pays (or really, doesn’t pay) claims. The Missouri Supreme Court has held Allstate’s feet to the fire and made it clear those “good hands” are less than clean. Georgia Allstate insureds should take note and understand even on a first person claim, where you may be making your own claim against your own insurance you have paid for, your insurance company will act as your adversary. 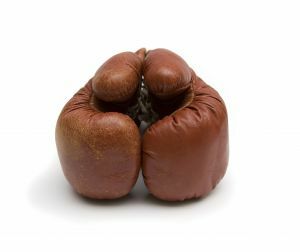 They are not “like a good neighbor” and you are not “in good hands”…they will put on their boxing gloves and will do everything humanly possible to avoid paying your claim. KANSAS CITY, Mo. (AP) — Allstate Insurance Co. has agreed to settle an insurance case that had attracted national attention over the insurer’s refusal — and eventual agreement — to provide key documents on how it evaluates and pays claims. The company’s reluctance to release the records led to more than $7 million in fines from Jackson County Judge Michael Manners. Manners has scheduled a July 21 hearing on whether to approve the settlement, which is the day the case was scheduled to go to trial. Attorneys for both sides say the terms of the deal are confidential. Allstate spokesman Mike Siemienas said the nation’s second-largest home and auto insurer was happy to resolve the case. He declined to comment further. The case stems from an 8-year-old accident on Interstate 70 involving Allstate policyholder Paul Aldridge, of Hawaii, who struck a truck from behind, severely injuring the driver. Aldridge later sued Allstate for bad faith after it refused for years to pay a claim. Attorneys for both Aldridge and the accident victim, Dale Deer, of Warrensburg, requested a set of records prepared by consultant McKinsey & Co. on behalf of the insurance company that showed how it set up a claims payment system in the 1990s aimed at generating big earnings while keeping claims payments low. Allstate refused to turn over the records, saying they contained trade secrets and would reveal the company’s trial strategy. In September, Manners held Allstate in contempt and began fining it $25,000 per day. The Missouri Supreme Court in November ordered Allstate to turn over the documents, leading the company to disclose more than 120,000 pages of records. Other states also have fought Allstate over the records, with Florida’s insurance commissioner, Kevin McCarty, suspending the company’s ability to sell insurance there after it refused subpoenas for the records. An appeals court later sided with McCarty. Allstate eventually signed an affidavit that it had turned over the records and would comply with future requests for documents, leading McCarty to lift the suspension. The company in April posted 150,000 pages of documents on the Internet related to how it handles customer claims.